"It's the end of feeling stressed about note-taking in class. Smartpens capture everything you hear and write so you can be confident that you'll never miss a word." Smartpens are an assistive technology that may benefit people who struggle with writing, listening, memory, and reading.A smartpen is a high-tech writing tool that records spoken words and synchronizes them with notes users write on special paper. A student can record everything a teacher says and later replay any part of a lecture by tapping the pen's tip on words written throughout the class.The Echo and Pulse from Livescribe are among the most popular smartpens. Livescribe smartpens convert handwritten notes and audio into digital format for access through the devices we use daily. No matter what your learning style is, a smartpen lets you capture words, scribbles and diagrams and syncs everything to what is said. Livescibe makes taking notes more useful and assessable for everyday life. "Livescribe smartpens have an embedded infrared camera that detects penstrokes on special Livescribe paper, allowing notes to be recorded digitally in real time." It helps students with learning disabilities take notes. This is a video from the Livescribe website that shows college students with learning disabilities talk about how the smartpen helps them and makes class and taking note less stressful for them. How much memory does the smartpen hold? 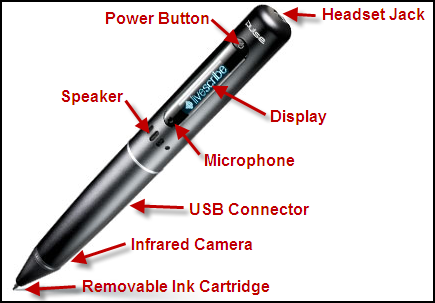 The various Echo smartpen models hold 200 (2GB), 400 (4GB), or 800 (8GB) hours of recorded audio. Once you hit that threshold, merely archive your notes and audio recordings to your computer – you will have a permanent back up of your notes and audio and can wipe your smartpen and start over.